Tibet (བོད), the Roof of the World with an average altitude of 4,900 m, is the highest region on Earth. 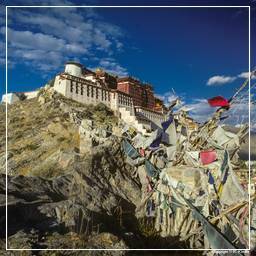 Songtsen Gampo unified Tibet first in the 7th century. This once independent kingdom located north of the Himalayas is today part of China. The Dalai Lamas, a line of Tibetan spiritual leaders, ruled Tibet from the 17th century until its incorporation into China in the 1950s. Tenzin Gyatso, who was born in eastern Tibet (Amdo) in 1935 and was recognised as the latest reincarnation of the Dalai Lama, fled to exile in India in 1959 following the invasion of Tibet.